.308 Winchester 125 Grain Nosler AccuBond~ The .308 Winchester is a rimless, bottlenecked rifle cartridge and is the commercial cartridge from which the 7.62x51mm NATO round was derived. The .308 Winchester was introduced in 1952, two years prior to the NATO adoption of the 7.62×51mm NATO T65. Winchester branded the cartridge and introduced it to the commercial hunting market as the .308 Winchester. Winchester’s Model 70, Model 100 and Model 88 rifles were subsequently chambered for the new cartridge. The .308 Winchester is one of the most popular hunting cartridges in the United States, and possibly the world. It has gained popularity in many countries as an exceptional cartridge for game in the medium- to large-sized class. In North America it is used extensively on whitetail deer, pronghorn and even the occasional caribou or black bear. Clay Harvey, an American gun writer, says it is usable on moose and elk. Layne Simpson, an American who has hunted in Sweden, says he is surprised how many hunters there use the cartridge. 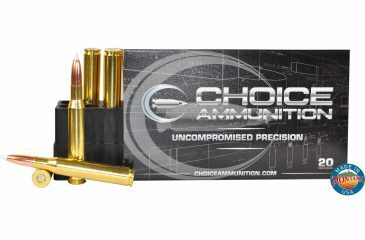 Craig Boddington was told by a Norma Precision executive that the .308 Winchester is one of Norma’s best-selling calibers. In Africa the .308 Winchester is one of the most popular calibers among Bushveld hunters and is used on anything from duiker right up to the massive eland (a small and large African antelope respectively). 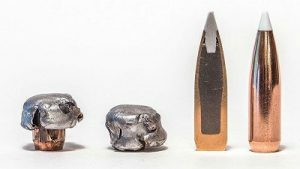 Proponents of the hydrostatic shock theory contend that the .308 Winchester has sufficient energy to impart hydrostatic shock to living targets when rapidly expanding bullets deliver a high rate of energy transfer. It is also used for target shooting, metallic silhouette, bench rest target shooting, palma, metal matches, military sniping, and police sharpshooting. The relatively short case makes the .308 Winchester especially well-adapted for short-action rifles. 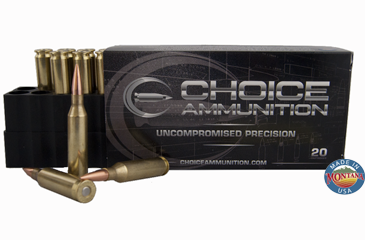 Choice Ammunition has taken our 100% hand-loading techniques and produce an extremely accurate, highly dependable round for the .308 Winchester in this load. Our loading tolerances are only matched by passionate hand-loaders in their own loading rooms. Consistent seating depths, powder charges and proprietary formulas of Choice Ammunition, make this 125 grain Nosler AccuBond round the best you can buy on the commercial market today. .308 Winchester 150 grain Hornady GMX~ The .308 Winchester is a rimless, bottlenecked rifle cartridge and is the commercial cartridge from which the 7.62x51mm NATOround was derived. The .308 Winchester was introduced in 1952, two years prior to the NATO adoption of the 7.62×51mm NATO T65. Winchester branded the cartridge and introduced it to the commercial hunting market as the .308 Winchester. Winchester’s Model 70, Model 100 and Model 88 rifles were subsequently chambered for the new cartridge. The .308 Winchester is one of the most popular hunting cartridges in the United States, and possibly the world. It has gained popularity in many countries as an exceptional cartridge for game in the medium- to large-sized class. In North America it is used extensively on whitetail deer, pronghorn and even the occasional caribou or black bear. Our 100% Hand-Loaded 150 Hornady GMX rounds are loaded with extremely tight tolerances, producing highly accurate, consistent and reliable performance with each and every shot! Our proprietary load formulas and loading process create the finest round of ammunition available on the commercial market today we feel. If you don’t load your own ammunition- let us do it for you! 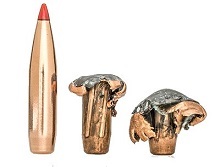 Features Hornady’s GMX bullet. Hard-hitting and deep-penetrating, the GMX bullet combines monolithic construction with pioneering ballistic design to meet the need for a premium, non-traditional bullet. The mono-metal design of the GMX bullet is crafted from a copper alloy. Harder than solid copper, the copper/zinc alloy has been proven to shoot cleaner, foul less, and deliver consistent, even pressure curves. The tough alloy material routinely retains 95% or more of its original weight and expands up to 1.5 times its original diameter. 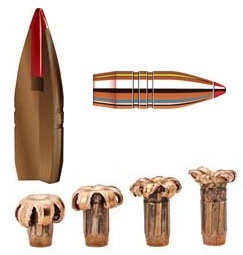 Featuring a long, sleek profile with cannelures, the design reduces the bullet’s overall bearing surface and drag, while achieving some of the highest ballistic coefficients from monolithic, non-traditional bullets. 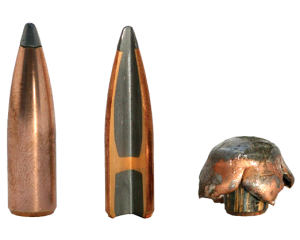 Initiating expansion upon impact, the hard polymer tip drives into the hollow cavity at the front of the bullet, creating a mushroom-style projectile as it travels through the animal. .308 Winchester 150 grain Hornady SST- The .308 Winchester is a rimless, bottlenecked rifle cartridge and is the commercial cartridge from which the 7.62x51mm NATOround was derived. The .308 Winchester was introduced in 1952, two years prior to the NATO adoption of the 7.62×51mm NATO T65. Winchester branded the cartridge and introduced it to the commercial hunting market as the .308 Winchester. Winchester’s Model 70, Model 100 and Model 88 rifles were subsequently chambered for the new cartridge. The .308 Winchester is one of the most popular hunting cartridges in the United States, and possibly the world. It has gained popularity in many countries as an exceptional cartridge for game in the medium- to large-sized class. In North America it is used extensively on whitetail deer, pronghorn and even the occasional caribou or black bear. .308 Winchester 150 Grain Nosler AccuBond~ The .308 Winchester is a rimless, bottlenecked rifle cartridge and is the commercial cartridge from which the 7.62x51mm NATOround was derived. The .308 Winchester was introduced in 1952, two years prior to the NATO adoption of the 7.62×51mm NATO T65. Winchester branded the cartridge and introduced it to the commercial hunting market as the .308 Winchester. Winchester’s Model 70, Model 100 and Model 88 rifles were subsequently chambered for the new cartridge. The .308 Winchester is one of the most popular hunting cartridges in the United States, and possibly the world. It has gained popularity in many countries as an exceptional cartridge for game in the medium- to large-sized class. In North America it is used extensively on whitetail deer, pronghorn and even the occasional caribou or black bear. Our 100% Hand-Loaded 150 grain Nosler AccuBond rounds are loaded with extremely tight tolerances, producing highly accurate, consistent and reliable performance with each and every shot! Our proprietary load formulas and loading process create the finest round of ammunition available on the commercial market today we feel. If you don’t load your own ammunition- let us do it for you! 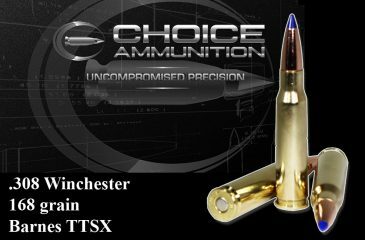 .308 Winchester 168 grain Barnes TTSX~ The .308 Winchester is a rimless, bottlenecked rifle cartridge and is the commercial cartridge from which the 7.62×51mm NATO round was derived. The .308 Winchester was introduced in 1952, two years prior to the NATO adoption of the 7.62×51mm NATO T65. Winchester branded the cartridge and introduced it to the commercial hunting market as the .308 Winchester. Winchester’s Model 70, model 100 and Model 88 rifles were subsequently chambered for the new cartridge. 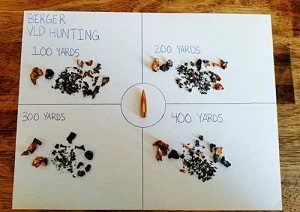 The .308 Winchester is one of the most popular hunting cartridges in the United States, and possibly the world. It has gained popularity in many countries as an exceptional cartridge for game in the medium- to large-sized class. In North America it is used extensively on whitetail deer, pronghorn and even the occasional caribou or black bear. Clay Harvey, an American gun writer, says it is usable on moose and elk. Layne Simpson, an American who has hunted in Sweden, says he is surprised how many hunters there use the cartridge. Craig Boddington was told by a Norma Precision executive that the .308 Winchester is one of Norma’s best-selling calibers. In Africa he .308 Winchester is one of the most popular calibers among Bushveld hunters and is used on anything from duiker right up to the massive eland (a small and large African antelope respectively). Proponents of the hydrostatic shocktheory contend that the .308 Winchester has sufficient energy to impart hydrostatic shock to living targets when rapidly expanding bullets deliver a high rate of energy transfer. 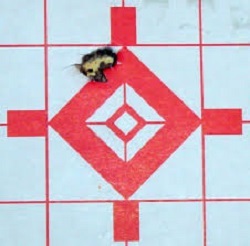 It is also used for target shooting, metallic silhouette bench rest target shooting, palma, metal matches, military sniping, and police sharpshooting. The relatively short case makes the .308 Winchester especially well-adapted for short-action rifles. Our 100% Hand-Loaded 168 Barnes TTSX rounds are loaded with extremely tight tolerances, producing highly accurate, consistent and reliable performance with each and every shot! Our proprietary load formulas and loading process create the finest round of ammunition available on the commercial market today we feel. If you don’t load your own ammunition- let us do it for you! .308 Winchester 168 Grain Berger VLD-Hunting~ The .308 Winchester is a rimless, bottlenecked rifle cartridge and is the commercial cartridge from which the 7.62x51mm NATOround was derived. The .308 Winchester was introduced in 1952, two years prior to the NATO adoption of the 7.62×51mm NATO T65. Winchester branded the cartridge and introduced it to the commercial hunting market as the .308 Winchester. Winchester’s Model 70, Model 100 and Model 88 rifles were subsequently chambered for the new cartridge. The .308 Winchester is one of the most popular hunting cartridges in the United States, and possibly the world. It has gained popularity in many countries as an exceptional cartridge for game in the medium- to large-sized class. In North America it is used extensively on whitetail deer, pronghorn and even the occasional caribou or black bear. .308 Winchester 178 Grain Hornady BTHP Match~ The .308 Winchester is a rimless, bottlenecked rifle cartridge and is the commercial cartridge from which the 7.62x51mm NATO round was derived. The .308 Winchester was introduced in 1952, two years prior to the NATO adoption of the 7.62×51mm NATO T65. Winchester branded the cartridge and introduced it to the commercial hunting market as the .308 Winchester. Winchester’s Model 70, Model 100 and Model 88 rifles were subsequently chambered for the new cartridge. The .308 Winchester is one of the most popular hunting cartridges in the United States, and possibly the world. It has gained popularity in many countries as an exceptional cartridge for game in the medium- to large-sized class. In North America it is used extensively on whitetail deer, pronghorn and even the occasional caribou or black bear. While .308 Winchester has traditionally been the most popular cartridge in the past, the development of lighter recoil chamberings with sufficient downrange energy, like the 7mm-08 Remington, .260 Remington, and 6.5 Creedmoor, is becoming more common for metallic silhouette shooting. 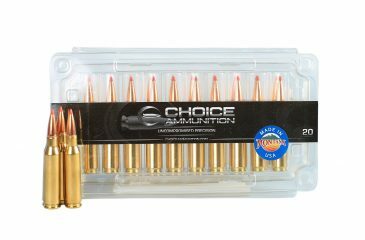 Choice Ammunition has taken our 100% hand-loading techniques and produce an extremely accurate, highly dependable round for the .308 Winchester in this load. Our loading tolerances are only matched by passionate hand-loaders in their own loading rooms. Consistent seating depths, powder charges and proprietary formulas of Choice Ammunition, make 178 BTHP round the best you can buy on the commercial market today. We produce this round for numerous long-range schools that use Choice Ammunition exclusively- as well as competitive shooters across the country. The bullet jackets are a technological advancement in design, tooling and manufacturing that combine to produce the most consistently concentric bullet jackets available. These proven AMP jackets are the foundation for exceptional bullet accuracy and have virtually zero runout and near zero wall thickness variation. Coupled with precision swaged cores and manufactured to the tightest standards in the industry, all Hornady Match bullets provide superior consistency, high ballistic coefficients and unprecedented levels of accuracy. .308 WINCHESTER 178 grain Hornady ELD-X- The .308 Winchester is a rimless, bottlenecked rifle cartridge and is the commercial cartridge from which the 7.62x51mm NATOround was derived. The .308 Winchester was introduced in 1952, two years prior to the NATO adoption of the 7.62×51mm NATO T65. Winchester branded the cartridge and introduced it to the commercial hunting market as the .308 Winchester. Winchester’s Model 70, Model 100 and Model 88 rifles were subsequently chambered for the new cartridge. 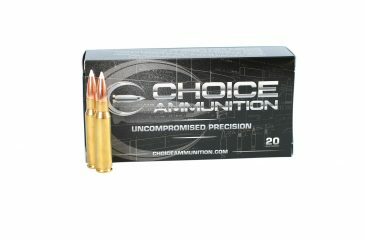 The .308 Winchester is one of the most popular hunting cartridges in the United States, and possibly the world. It has gained popularity in many countries as an exceptional cartridge for game in the medium- to large-sized class. In North America it is used extensively on whitetail deer, pronghorn and even the occasional caribou or black bear. 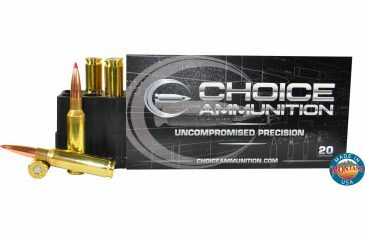 Choice Ammunition has taken our 100% hand-loading techniques and produce an extremely accurate, highly dependable round for the .308 Winchester in this load. Our loading tolerances are only matched by passionate hand-loaders in their own loading rooms. Consistent seating depths, powder charges and proprietary formulas of Choice Ammunition, make this 178 grain Hornady ELD-X round the best you can buy on the commercial market today. .308 Winchester 180 Grain Nosler Partition~ The .308 Winchester is a rimless, bottlenecked rifle cartridge and is the commercial cartridge from which the 7.62x51mm NATO round was derived. The .308 Winchester was introduced in 1952, two years prior to the NATO adoption of the 7.62×51mm NATO T65. Winchester branded the cartridge and introduced it to the commercial hunting market as the .308 Winchester. Winchester’s Model 70, Model 100 and Model 88 rifles were subsequently chambered for the new cartridge. The .308 Winchester is one of the most popular hunting cartridges in the United States, and possibly the world. It has gained popularity in many countries as an exceptional cartridge for game in the medium- to large-sized class. In North America it is used extensively on whitetail deer, pronghorn and even the occasional caribou or black bear. 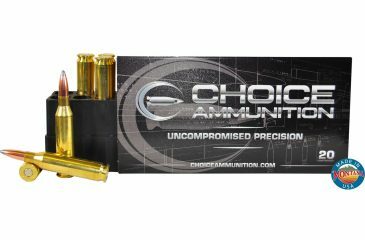 Choice Ammunition has taken our 100% hand-loading techniques and produce an extremely accurate, highly dependable round for the .308 Winchester in this load. Our loading tolerances are only matched by passionate hand-loaders in their own loading rooms. Consistent seating depths, powder charges and proprietary formulas of Choice Ammunition, make this 180 grain Nosler Partition round the best you can buy on the commercial market today. .308 Winchester 185 Grain Berger VLD-Hunting~ The .308 Winchester is a rimless, bottlenecked rifle cartridge and is the commercial cartridge from which the 7.62x51mm NATO round was derived. The .308 Winchester was introduced in 1952, two years prior to the NATO adoption of the 7.62×51mm NATO T65. Winchester branded the cartridge and introduced it to the commercial hunting market as the .308 Winchester. Winchester’s Model 70, Model 100 and Model 88 rifles were subsequently chambered for the new cartridge. The .308 Winchester is one of the most popular hunting cartridges in the United States, and possibly the world. 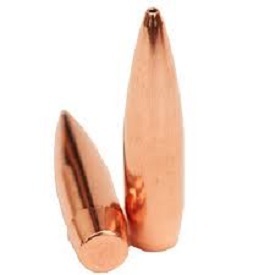 It has gained popularity in many countries as an exceptional cartridge for game in the medium- to large-sized class. In North America it is used extensively on whitetail deer, pronghorn and even the occasional caribou or black bear. 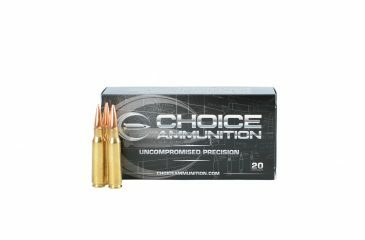 Choice Ammunition has taken our 100% hand-loading techniques and produce an extremely accurate, highly dependable round for the .308 Winchester in this load. Our loading tolerances are only matched by passionate hand-loaders in their own loading rooms. Consistent seating depths, powder charges and proprietary formulas of Choice Ammunition, make this 185 Berger VLD-Hunting round the best you can buy on the commercial market today.